The Canadian province of Alberta is a leader when it comes to wind energy, and with the 88 MW Wintering Hills project, energy company Suncor has now finished three projects in the wind-rich province. Like the state of Texas—to which it is sometimes compared—the Canadian province of Alberta is a leader when it comes to energy, both conventional energy and alternative energy. The province, which lies directly north of Montana, has been a major oil and natural gas producer for decades. Like Texas, Alberta has also been a leader in wind energy. It was #3 in production of wind energy among Canadian provinces at the end of 2011, generating some 891 MW. That production number continues to grow, most recently with the Wintering Hills wind project, in the southern part of Alberta, about 90 miles northeast of the province's largest city, Calgary. The 88 MW project is the largest wind power project in the province. Interestingly, also like some wind projects in the U.S., Wintering Hills was built by a traditional energy company, Suncor. Suncor has operations in the massive oil sands in northern Alberta, which supply oil to both the U.S. and Canadian markets. The company also has a major presence in the Canadian retail gasoline market, through Petro Canada. Mining company Teck Resources has a 30 percent stake in Wintering Hills. Teck's share of the energy produced at Wintering Hills will be approximately 90,000 MW hours per year—more than 1.5 times the power consumption of the company's Cardinal River metallurgical coal operation in Alberta. In recent years, Suncor has broadened out beyond its fossil fuel energy base and now has six wind projects in Canada, with more in the planning stages. Wintering Hills, with its 55 GE 1.6 MW wind turbines across 15,000 acres of private land, is the largest to date. Three of the company's wind projects are in Alberta, two are in the province of Ontario, and one is in Saskatchewan. KoljaVainstein, project manager with the Major Projects group at Suncor Energy, explained that the company's involvement with renewable energy dates back more than a decade, to the early 2000s. "We reviewed a number of different renewables—wind, solar, geothermal—and at the time, wind seemed to be the most cost-effective and beneficial." He added that the end result a decade later is that Suncor is now an integrated energy company, rather than just being an oil sands energy company. Wind energy fits quite well into their portfolio of projects—and will into the future, from all indications. The company's goal is to develop a new renewable energy initiative every 12 to 18 months. With Wintering Hills, Vainstein explained that Suncor worked with local landowners over the course of several years, starting in 2005, with the project gaining momentum in 2008. "At the end of 2008, we submitted an Alberta Utilities Commission application, which is the main regulatory permit for these projects." Unlike the other two wind projects the company has in Alberta, Wintering Hills is located more in the south-central part of the province. The other two projects are in the southwestern part of the province, near the towns of Magrath and Taber. "But there are a lot of transmission constraints in the southern part of the province," Vainstein noted. "So Suncor made a conscious effort to look at other areas of Alberta that might be good for wind. We started putting up met towers in the south central part of the province in 2005. And now we have a number of sites, including Wintering Hills, which have very good wind regimes. They are kind of like diamonds in the rough on the prairies." There was a good wind resource, and just as important, there was transmission capacity. Suncor submitted their application to the Alberta electrical systems operator early in the game, ensuring they could connect to the grid. A 5.5-km high-voltage power line (144 kV) was built to interconnect with the ATCO Electric substation. The wind resource in that part of Alberta is different from the southwest, where most of the province's wind power projects are located, says Vainstein. "With the wind projects in southern Alberta, the wind tends to pick up very quickly and drop off very quickly. With Wintering Hills, it's a much more consistent wind regime throughout the day, and the technology has changed quite a bit since those early projects were built. We're starting to see taller machines, larger blade diameters, so we're able to increase the capacity factor of project sites." Landowners in the area tend to have big spreads, so they only had to deal with about 20 individuals to arrange land leases for Wintering Hills. There is a bit of grazing land, but most of the acreage is in cereal crops. Vainstein reports that there was a bit of a wind power education process with the local folks, but perhaps not as much as might be expected. "With any new area you go into, there is definitely an education process, to explain how wind power works, and how much land it will take up. Engineering company Hatch, which supplied Engineering, Procurement, and Construction Management for the Wintering Hills wind project, arranged for road share agreements with oil and gas companies, to cut down on the amount of road that had to be built to access the site. The Wintering Hills site is an active oil and natural gas field. "But here in Alberta, since there is so much oil and gas activity, landowners are quite familiar with dealing with leases. And in this case, the lease involves wind turbines. They're familiar with access roads and underground piping, but with wind power, of course, it's a bit different." The entire 15,000-acre project is located in Wheatland County, and Suncor made sure that government officials, elected and non-elected, were well informed about what the project would involve and addressed any environmental concerns. "We did about three years of avian and bat studies before we even decided to put a shovel into the ground for the project," said Vainstein. "There are wetlands and other areas that we needed to stay clear of, and that was all incorporated when we did our project plan. The project is relatively environmentally benign." 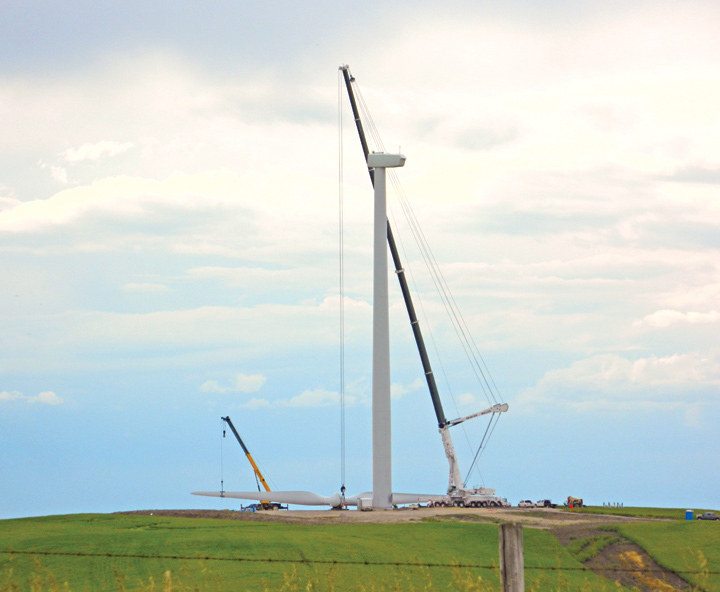 Engineering company Hatch has been involved with many of Suncor's wind projects, and it supplied Engineering, Procurement, and Construction Management (EPCM) services to Wintering Hills. Engineer for one of the first utility scale solar facilities to be installed in Ontario. Dan Perrin, Hatch's project manager on the Wintering Hills project, noted that it required a fair amount of road construction. "We built low-impact roads into the fields to get access, and we put in some new culverts and gates and there were some new approaches that we needed to get government approvals." Wherever possible, they arranged for road share agreements with oil and gas companies, to cut down on the amount of road that had to be built and make use of the existing road network. "Wintering Hills is an active oil and natural gas field, so there is a lot of activity on the site." Perrin explained that Wintering Hills was done in two phases, in 2010 and in 2011. "We had an extremely wet time in the fall of 2010, and that created some challenges," he said. Local farmers talked about that fall being the equivalent of a 50 or even a 100-year rain. "The wet weather forced us into the winter months of 2010/2011. Something that should have taken three or four months with good weather stretched out to ten months." It was so wet that some roads (including county grid roads) were impassable at points. When they were able to do the roadbuilding, they were careful not to mix the topsoil of the farmland with the subgrade material, which was clay. "We were cautious," says Perrin. "There wasn't very much topsoil to begin with, so what is there is very valuable to the landowners." The civil works and underground electrical collection system work was done by June 2011, and the erection contract began in early July. Though they had to contend with some very wet ground at points, you'd never know it from the good condition of the site now. Perrin said there were benefits to doing the project in two phases. "You can do a wind farm project construction job in six to eight months," he says. "But you have to have ideal conditions or throw money at it. With the weather that we had, it would have been really ugly to push through and try to get the project done in one year." With the amount of snow and cold weather they had through the winter, productivity would have dropped considerably, up to 35 percent, he added. Additional resources, whether they are cranes or skilled labor, can always be applied to a construction job, but at some point, the law of diminishing returns kicks in, and any benefits can be incremental. The people side of the equation is another reason to go multi-phase, says Perrin. "You can line up the skilled people and all of the equipment a bit more easily—it's less of a scramble." The two construction phases were very separate—roads and civil work were done in phase one, while erection and commissioning-related work were completed in phase two. Wrapping up construction and achieving commissioning in late 2011 worked well in terms of power generation, as winds pick up considerably during the winter months in that area of Alberta. Getting materials on site was fairly straightforward, as the project site is close to major transportation corridors, the Trans-Canada Highway, and a major provincial highway. Construction materials were sourced in the nearby communities of Strathmore and Drumheller. Once the people and materials are on site, it's all about management, says Perrin. At all levels, "projects need to be managed right," he says. "For example, with the right carpenters and a good supervisor, you can carry out something like concrete forming faster, more efficiently, and safer." Using good project and construction management tools and having the right team supervising the contractors means a project comes together easier, he says. That way when issues arise—as they do with any construction project—they are able to better handle them. "It also helps to have a good handle on the full scope of a project upfront," he added. As with any project, there's a bit of a learning curve. "It might take a week or two to do the electrical on the first turbine, but at the end of doing 55 turbines, it's only taking three days," he says. No two wind farm projects are exactly alike, but Perrin notes that since Hatch has done a large number of projects, it brings that expertise to the table. "We have that experience, so projects come in under budget and on time." That achievement can be all about organization, especially on a project as large as Wintering Hills, when you've got upwards of 175 people on site at the peak of construction. "It's having the right people there on the ground, and at the daily and weekly meetings, staying on top of safety and quality issues." Perrin said that Hatch can also help clients get the best possible prices on the big ticket items—the wind turbines. Suncor's KoljaVainstein said the GE turbines they selected are suited to the wind regime of Wintering Hills. "It's a variant of the machines we have on our other wind projects. It just has a larger rotor diameter and slightly higher MW output, going from 1.5 to 1.6 MW." The elevation is subtle on the site, about 100 meters, tops. "What makes this a good wind site and also a challenging site, is you have this ridge that opens up into a large plateau. The wind comes off the prairie, and as it accelerates, we get some nice wind speeds." Ledcor was the general contractor on the project. With such a large project site, the company says that staging of activities to meet the tight deadlines was critical. Noting that they were working in an area that is active with oil and gas activity, Ledcor carried out multiple sweeps to locate buried utilities and maintain safety standards. Ledcor's scope of work on the project included temporary access roads, permanent low impact roads, the underground cable collector system, ground wires and fiber optic cables, substation building foundations, and the 55 wind turbine bases. 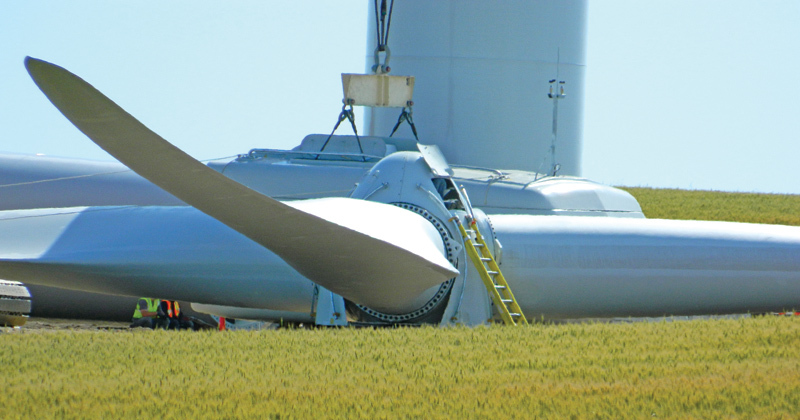 Eagle West did the turbine erection and the electrical work inside the turbines, while GE and Totran Transportation shipped the components to the site. Iconic Power and Controls did the electrical work for the substation. With the project completed in 2011, Wintering Hills is now well into the operating phase. enXco Service Canada has a multi-year agreement with Suncor Energy and partner, Teck Resources, to provide operations and maintenance services. Going forward, Suncor has a number of projects in the pipeline in Alberta, Saskatchewan, and Ontario. "We're also looking beyond those provinces to potential acquisitions or joint ventures," says Vainstein. "There are a lot of things going on in the background."